At a recent visit to the Family Museum's new Fox Hollow, there was a robber at the grocery store, grabbing (fake) money and announcing his deed. This probably wasn't what leaders of the Bettendorf museum wanted to happen with their renovated facility, but dictating any aspect of open-ended play is antithetical to the enterprise. So Museum Director Margaret Kuhl laughed when told about the Fox Hollow crime wave. "We don't have any police officers on duty," she conceded. "Maybe somebody from the fire department could have helped. ... We have that neighborhood concept of everybody looking out for each other." "It's very much an interactive learning environment and hands-on for children and their families, and I think it really offers a great experience to engage families in that play-to-learn concept." Kim Kidwell, the museum's manager of learning experiences and environment, said the planning process started in 2009. The Family Museum studied how long kids were playing in different areas, how much they were interacting with them, and how much they were interacting with the adults who brought them. It identified its primary audience as children age eight and under and decided to focus the renovation on them. "Kids learn best through things that they see and interact with every day," she said. "So we knew we wanted to have, for lack of a better word, a mini Quad Cities. We wanted to have bridges and the river represented." One goal, for example, was to show how locks and dams work. The Family Museum water feature allows visitors to control the flow of water: "A two-year-old may not understand that [lock-and-dam system], but they can certainly understand how to put a thing up so that the water rises ... ," Kidwell said. "You can kind of do it on their level." With early-childhood educators and advisory panels, she said, they established other attractions. Farmers and grocery-store representatives, for example, were brought in. Kidwell said they were asked, "Tell us the top five things you want kids to know about what you do." And then the museum "took those things, and we tried to incorporate them exhibit-style." Connections were also important, she added, and Fox Hollow is designed to emphasize the path from farm to table: "We really wanted kids to understand [how] food gets in the grocery store. ... It comes from someplace." The first phase of renovation - rivers and bridges - opened last fall, and Fox Hollow opened in mid-February. 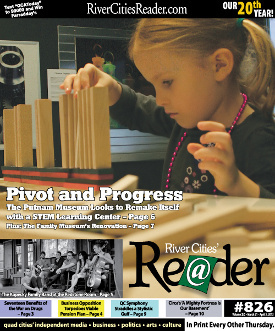 Museum Business & Community Relations Manager Jeff Reiter wrote that visitors last month were up nearly 46 percent compared to February 2012, and almost 75 percent from March 1 through 16 compared to the same period last year. Project funding included $630,000 from the City of Bettendorf - which runs the museum - and $195,000 from the Iowa Community Attraction & Tourism program. The Roy J. Carver Charitable Trust added $100,000, and the Scott County Regional Authority and Riverboat Development Authority contributed a combined $145,000.